Lynne Arriale is known for her style: lively, but still lyrical and intimate. She connects with her audience and tells her stories through emotionally charged performances. She released her 14th album as ensemble leader this June, with her first recording on Challenge Records. Give Us These Days marks a new course for Arriale and her trio: six original tunes and three arrangements speak directly to the heart, and reflect upon the nature of existence. What emerges is the theme of this record, brilliantly illuminated by the title track: given the unpredictability and impermanence of life, savor each moment. The album features renowned Dutch musicians like bassist Jasper Somsen, known for his signature sound, feel and lyricism, and drummer Jasper van Hulten, who brings boosts the group’s energy with his drums. With a cameo performance from vocalist Kate McGarry, in Take it With Me, combined with Arriale’s narrative piano playing, the song’s message of humility and gratitude is conveyed perfectly. 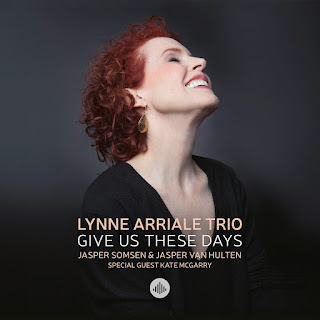 The Lynne Arriale Trio will be performing a unique show in The Netherlands on June 7th in the Catharinakapel in Harderwijk. Tickets and more information are available on the venue’s website.